This post has been significantly updated on 09/27/09 at 3pm JT and on 10/09/09 at 1:30am JT. Please re-read if you have read the original post. כל חותמי ברכות שהיו במקדש היו עד העולם. משקלקלו המינין יאמרו אין עולם אלא אחד התקינו שיהיו אומרים מן העולם ועד העולם ומודיעין שהעולם הזה בפני העולם הבא כפרוזדור בפני טרקלין. Mishna 9:5 stated that originally in the Bet Hamikdash all Berachot would end with the phrase Min Haolam and later it was changed to Min Haolam Vead Haolam due to the heretics. This Tosefta changes the wording of this ending phrase a little bit and provides an explanation for it. This is referring to all Berachot that have an ending with the words Baruch Ata Hashem. For example, Berachot of Shemah or Shmoneh Esreh all end with the phrase Baruch Ata Hashem … It is not referring to single Berachot that do not have an ending such as Berachot on food or on smell. In fact, based on the context of the next Tosefta it would seem that all of these deviations from the common standard of Berachot applied only to the prayers of Shema and Shmoneh Esreh and not to individual Berachot. Rabbi Baruch Tzvi Gruner proves this in his book Berachot Shenishtaku (ברכות שנשתקעו, Mosad Harav Kook, 2003, p. 38) from the fact that the Tosefta (Berachot 5:23) quoted various Berachot that were said in the Bet Hamikdash before eating various sacrifices without any of the changes mentioned in this Tosefta. The way that the Berachot were said in the Bet Hamikdash is not exactly clear. If we would take as an example our version of Shmoneh Esreh then if a person was praying Shmoneh Esreh in the Bet Hamikdash he would conclude the first Beracha of Shmoneh Esreh as follows: Baruch Ata Hashem Ad Haolam Magen Avraham (ברוך אתה ה’ עד העולם מגן אברהם) – Blessed You Hashem Until the World [to Come] The Shield of Avraham. However, see Talmud Bavli (Taanit 16b), where it quotes the 7th Beracha of Shmoneh Esreh of Goel Yisrael (the Redeemer of Israel) with a slightly different beginning (Baruch Hashem Elohey Yisrael Ad Haolam …) Also, see Rashi (Sotah 40b, Kumu) who explains that the source for such phrasing of Berachot in the Bet Hamikdash is the book of Ezra. That seems to be a mistake as no such thing appears in the book of Ezra. Most probably Rashi is referring to King David’s prayer mentioned in the book of Divrei Hayamim (1 16:36) where such a Beracha does appear in the context of a prayer that was said in front of the Aron (the Ark) which can be interpreted as something that should have been said in the Bet Hamikdash. Also the same phrase appears in two places in Tehillim (41:14 and 106:48). It should be noted that the Mishna (Berachot 9:5) that is printed in the Mishnayot instead of saying Ad Holam says Min Haolam (from [this] world) implying that it is referring to this world and not to the World to Come. It is not clear which one of these phrases is more correct as there are multiple sources that quote each one of them. Talmud Bavli (Berachot 63a) learns out the source for this change in the phrasing of Berachot in the Bet Hamikdash from verses in Nechemiah. The word מין generally means a sectarian or a heretic. It is often used to refer to Jewish Christians, but I do not think that is the meaning in this case, because the Christians did believe in the World to Come and the events referred to in this Tosefta are of much earlier origin than Christians, as will be explained in the next note. The etymology of the word Min is unclear. Aruch Hashalem (Vol. 5, page 168, entry מן) cites a few possible explanations. Either it is simply a play on the word מין (Min) meaning “type” or “kind”, referring that they were comprised from various types of people with different beliefs. Or it is an abbreviation of the word מאמין (Maamin) meaning a “believer” which is how the heretics referred to themselves in response to which the Rabbis cutoff the word and gave them a nickname Min. A 3rd possibility that it comes from the Hebrew word מאן (Meen) meaning “deny” or “refuse”, meaning that they refused their original religion and adopted a new form of it. He cites that the Greek word σχίσμα (Skisma) meaning a “schism” or a “religious split” also comes from the Greek word σχίζω (Skizo) which means “split” or “divide”, which is a similar type fo etymology. Based on this explanation the correct translation of the word מין is “schismatic” meaning someone who split off from the original religion and formed a new form of it. Meaning that this world is the ultimate end and there is no World to Come (i.e. Afterlife) where God executes final judgement over people. The Tosefta is most probably referring to Hellenized Jews who followed the school of Epicureanism who primarily rejected divine intervention and afterlife and followed a hedonistic lifestyle. The Hebrew word Apikorus, meaning heretic, comes directly from the Greek word Ἐπίκουρος (Epikouros) which was the name of the Greek philosopher who founded Epicureanism. Since Epikouros founded Epicureanism around 307 BCE we can conjecture that this change in the Berachot in the Second Bet Hamikdash was a relatively early inactment passed as early as the 3rd century BCE. The words Min and Apikorus in Talmudic literature are often used interchangeably so it should not pose a problem of why the Tosefta specifically used the word Min and not the word Apikorus, which would better fit in this particular case. It is also possible that the Tosefta is reffering to Tzedukim (Sadducees) who among other things followed the teachings of Epicurians and rejected the belief in Afterlife. But most probably the Tosefta is referring to all of these groups together which is why it uses a more generic word Min and nto the more specific words such as an Apikorus or Tzeduki. Following the earlier example mentioned above in note 3 of the first Beracha of Shmoneh Esreh, the Beracha would look as follows: Baruch Ata Hashem Min Haolam Vead Haolam Magen Avraham (ברוך אתה ה’ מן העולם ועד העולם מגן אברהם) – Blessed You Hashem From [this] World and Until the World [to Come] The Shield of Avraham. The word פרוזדור (Prozdor) comes from the Greek word πρόθυρον (Prothuron) meaning a vestibule. The word טרקלין (Traklin) comes from the Greek word τριχλίνιον (Triklinion) and the Latin word “triclinium” meaning a dining room or a banquet hall. The emphasis of the decree of the Rabbis was on the fact that this physical world is not the main place where the people are destined to be, but rather it is the spiritual World to Come where the soul goes after death and receives final judgement. The Rabbis have emphasized the cruciality of the belief in the World to Come in Judaism in various places through out the Talmudic literature. הפותח ביוד הי וחותם ביוד הי הרי זה חכם. באלף למד וחותם ביוד הי הרי זה בינוני. ביוד הי וחותם באלף למד הרי זה בור. באלף למד וחותם באלף למד הרי זה דרך אחרת. Mishna Berachot 9:5 states that the Rabbis instituted that people should greet each other using God’s name. In reference to that the Tosefta states a new law regarding the usage of God’s name in Berachot. The Tosefta is referring to Berachot that have God’s name both in the beginning of the Beracha and at the end, such as the Beracha of Kiddush on Friday night. It begins with the phrase Baruch Ata Hashem … and ends with the phrase Baruch Ata Hashem. There is a prohibition in the Torah to say God’s name in vain. See Shemot 20:7. Due to that prohibition Jews are very careful with pronunciations of God’s various names. In addition to that Jews are also very careful with writing of God’s names since some of them cannotbe erased and the paper on which they are written has to be buried out of respect and cannot be simply thrown in the garbage. God’s four letter name is written in the Torah, as יהוה, known in English as Tetragrammaton. Outside of the service in Bet Hamikdash on Yom Kippur it was never pronounced. When Berachot are said the name that is used is אדני (Adonai) which means “My Master”. In general speech, not in religious services, even the name Adonai is not pronounced and instead the name השם (Hashem) is used, which simply means “The Name”. There are various abbreviations that are used in Hebrew to represent these names without directly spelling them out. The name Hashem is usally abbreviated as ה’. The name Adonai is often abbreviated as יי. The four letter name is often abbreviated by its first two letters יה. This Tosefta uses this abbreviation to refer to the four letter name, but not to that name itself, but rather as it would be pronounced in a Beracha, namely Adonai. I would like to point out that Higayon Aryeh is incorrect in commenting that the Tosefta means that the Rabbis have decreed that people should pronounce the actual four letter name of God in the Berachot since no such evidence exists that such thing was ever done, but rather it refers to the name Adonai as I already explained. The Rabbis coined the text of all Berachot that God’s name in them should be pronounced as Adonai. Therefore a person who follows the Rabbi’s instructions exactly is considered to be a wise person, meaning that he is learned in Torah. God’s names אל (El) or אלהים (Elohim) both mean “God”. TheTosefta refers to both of them by the shorter form El. These names of God are of lower sanctity and are therefore never used in Berachot as a direct reference to God. If the person began his Beracha by saying Baruch Ata El … and ended it by saying Baruch Ata Adonai … then he is considered to be an average person, meaning someone who is not very learned in Torah since he did not follow the exact prescription of the Rabbis regarding the pronounciation of the Beracha, but he is also not considered to be very crude, like a boor since he completed the Beracha using the correct name, and we consider that the completion of the Beracha is the final statement of the person’s intent. See Talmud Bavli (Berachot 12a) where it says that by Berachot everything goes after the ending. For the etymology and explanation of the Hebrew word Bur see above Tosefta 6:23, note 8. Since he completed the Beracha with the name El we consider it to be as if he did not follow the prescription of the Rabbis, since in Berachot everything goes after the ending, and he is therefore considered to be a boor. I think that the reason the Rabbis called such a person a boor, meaning that he is not learned in Torah and he has no fear of God, as opposed to an Am Haaretz who is a God fearing person, but not learned in Torah, is because the person ended up saying God’s name in vain twice by ending the Beracha with the name El. He did not fullfil the obligation of the Beracha since he did not follow the correct prescription of the text and therefore said both of God’s names, Adonai in the beginning of the Beracha and El in the end of the Beracha, in vain. Since he said God’s name in vain so much he is considered to have no fear of God and is therefore called a boor. Professor Saul Lieberman in an article (Saul Lieberman, “Light on the Cave Scrolls from Rabbinic Sources”, Proceedings of the American Academy for Jewish Research, Vol. 20 (1951), pp. 395-404.) translates the words Derech Acheret to mean “heterodoxy”, which means a view that does not follow established, or orthodox opinions, such as the opinion of the Rabbis, but rather a dissenting view of a radical group of Jews who wanted to be stricter than the Rabbis, namely the Essenes, who authored the text called Manual of Discipline (also known as Community Rule) found among the Dead Sea Scrolls in 1947 (manuscript 1QS), in which they specifically avoid the use of God’s name Adonai. He explains that this group of Jews refused to pronounce God’s name, Adonai, even in Berachot where it was not only explicitly permitted but required to do so. Lieberman further points out that in the Manual of Discipline (manuscript 1QS, plate XI, verse 13) there is a Beracha written in the form ברוך אתה אלי … (Baruch Ata Eli) – Blessed You My God. For a detailed discussion of the Manual of Discipline, its authors, as well as its text in English see Preben Wernberg-Møller, “The manual of discipline, Volume 1 of Studies on the texts of the desert of Judah”, Brill Archive, 1957. For a complete list of all places in the Dead Sea Scrolls where the name El appears in a Beracha see James H. Charlesworth, “Graphic concordance to the Dead Sea scrolls”, Westminster John Knox Press, 1991, p. 91, entry ברוך. רבי יוסי ברבי יהודה אומר הרי הוא אומר (אסתר ד:ב) כי אין לבוא אל שער המלך בלבוש שק. על אחת כמה וכמה קלין וחמורין בדבר. ורקיקה מקל וחומר. ומה מנעל שאין בו דרך בזיון אמרה תורה אל תכנס במנעל קל וחומר לרקיקה שיש בה דרך בזיון. The Tosefta continues its discussion from the previous Tosefta. Rebbi Yossi Ben Rebbi Yehudah argues on the reason for the laws stated in the previous Tosefta and provides his own reason. In addition, the Tosefta explains what is the Kal Vachomer from which we learn that spitting is forbidden on the Temple Mount, as stated in Mishna 9:5 of Berachot. The verse in Esther refers to why Mordechai was not allowed to enter the palace of King Achashverosh while he was wearing sackcloth and mourning over Haman’s decree to destroy the Jews. It was forbidden to enter the king’s palace while wearing sackcloth. The Kal Vechomer in this case is obvious. Since it was not allowed to enter the palace of a human king while not dressed appropriately then how much more so it should not be allowed in the Temple of God who is the King of kings. Rebbi Yossi Ben Rebbi Yehudah felt that it is much better to derive all of the laws stated in the previous Tosefta from this verse in Esther using the Kal Vechomer than from the verse in Kohelet that was stated in the prevous Tosefta. The reason that Rebbi Yossi Ben Rebbi Yehudah felt this way is most probably because the lesson of this Kal Vechomer is a lot more powerful than the verse in Kohelet since people understood very well how severe the punishments were for violating palace rules of human kings. This is probably he says that there are many Kal Vechomer derivations from this verse in Esther and not just one, since people can imagine all kinds of reasons why rules in God’s palace are more stringent than in a human king’s palace. The reference to spitting was stated in Mishna 9:5. The Tosefta now explains what the Kal Vechomer is. The Torah does not explicitly say that a person is not allowed to wear shoes on the Temple Mount. However there is a hint in the Torah for that. Moshe was told by God to remove his shoes when he went up to the mountain to see the burning bush, because it was a holy place. See Shemot 3:5. The reason that the Tosefta did not quote this verse as the source for not wearing shoes on the Temple Mount is because it wanted to quote a more general reference from which all of the mentioned prohibitions could be learned from and not just the prohibition of wearing shoes. It should be noted that the text of this Tosefta in the regular printed editions is completely reversed, which gives it a different meaning and is not correct. It seems that it was edited based on the Beraita quoted in Talmud Bavli (Berachot 62b) which is a different Beraita although it looks very similar to this Tosefta. I have quoted and explained the text based on the way it appears in the Vienna and Erfurt manuscripts of the Tosefta. לא יכנס אדם להר הבית במעות צרורין לו בסדינו, ובאבק שעל רגליו, ובפונדתו חגורה עליו מבחוץ שנאמר (קהלת ד:יז) שמר רגליך כאשר תלך אל בית האלהים. Mishna 5 of chapter 9 says that a person should not enter the Temple Mount with a variety of objects including the dust on his feet and the belt. This Tosefta adds another item to the list, money, and provides a reference from a verse for this law. The Temple Mount is the mountain on which the Bet Hamikdash (The Temple) was located. The Tosefta is referring to the mountain itself regardless whether the Bet Hamikdash was standing or not. The Temple Mount is considered to be holy by itself. The word סדין (Sadin) literally means sheet. The Tosefta is referring to the most common Greek outer garment called the Pallium which was worn by Jews as well. It was basically a large sheet wrapped around the body and was usually held by a brooch. The reason it was called the sheet was not only because it looked like a sheet, but because it was often used as a sheet to sleep on. The Pallium should not be confused with the Roman Toga which was a completely different garment and was mostly worn by Roman aristocracy and not by common people who preferred the Pallium due to its simplicity. 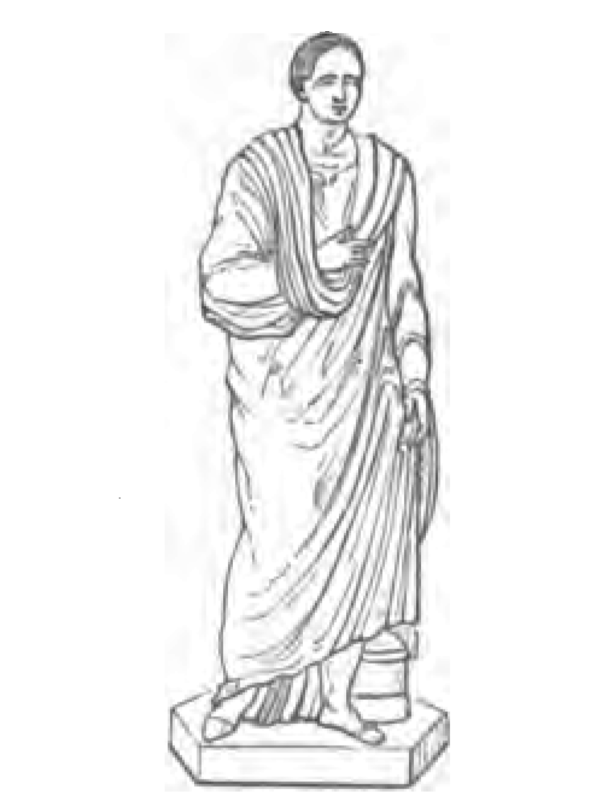 The Pallium was usually worn on top of an undergarment called the Chiton or the Tunica which covered the private parts although some people, usually the poor, did not wear any undergarments and wore the Pallium directly on their naked body. For details about the Pallium see William Smith, “Dictionary of Greek and Roman Antiquities”, London 1890, p.851-853, entry Pallium. I am not exactly sure what is meant by the money being bundled inside the cloak. Usually the money was carried inside the pocket of the money-belt, but the Tosefta lists the belt separately, so it must mean that the money was carried somehow in the cloak itself and not in the belt. It is possible it simply means that the coins were held inside a small bag which was brooched to the cloak by the same brooch that held the cloak together. The reason that a person should not enter the Temple Mount with money is because it appeared that he is coming to do business there which is a mundane matter. The Tosefta cannot mean that a person was not allowed to bring any money at all, since the person had to bring some money with him in order to be able to purchase the sacrifices in the temple. It probably refers to a relatively large bag of coins which was inconvenient to carry in his hands, which is why it had to be attached to the brooch of his cloak. The Pallium was usually short and ended above the knee so it would be easier to run in it. The Toga was a lot more complex than the Pallium. Most people wore sandals or some other type of open shoes so their feet got really dusty as they walked on dirt roads. No one was allowed to wear shoes at all on the Temple Mount. See Mishna Berachot 9:5. People were supposed to remove their shoes rightr before they entered the Temple Mount and wash off the dust off their feet as a sign of respect for the holy place. The word פונדא (Punda) comes from the Greek word φούνδα (Founda) and from the same Latin word “funda” which means a pocket for money or a purse. See Aruch Hashalem by Alexander Kohut ( Vol 6, p. 366, entry פנדה). Usually it refers to a belt with a hollow space inside it which was commonly used to put money in it. See Mishna Shabbat 10:3 and Keilim 27:6. This translation is followed by Rashi (Berachot 54a, Bepundato). It also makes sense etymologically to explain it as a money-belt, because the Latin word “funda” originally refered to a leather sling that was used by slingers in the Roman army. Since the sling was essentially a leather belt the word got an additional meaning to refer to a money-belt. It seems that the reason for taking off the belt and putting it back on the inside of his cloak was the same as for removing the money from the cloak, which was so that it would not appear that the person is coming to do business on the Temple Mount. However, the Rambam in his commentary on the Mishna (Berachot 9:5, Keilim 27:6 and Keilim 29:1) explains that Punda is an undergarment which was worn under the main clothing to protect it from getting ruined by sweat, which also had pockets to carry money in it. This Tosefta is referring to the case where the person was wearing this soiled undergarment on the outside of his clothes which is very disrespectful and therefore he either had to remove it or put it back underneath his outside clothing. The Rambam seems to explain that the problem was wearing it on the outside was that it was dirty and disrespectful and not because it had money in it. See his commentary on Mishna Berachot 9:5. It is unclear where the Rambam got his translation and explanation from. I have chosen to translate the word Punda as a money-belt since it is a more accepted meaning of this word with a known etymology. The verse in Kohelet issues a general caution to people who go to the Bet Hamikdash to bring sacrifices that they should be careful about why they are going there and what they are going to do there. The verse is not being literal to refer to a person’s feet specifically. Therefore the Tosefta uses this verse as a source for all of the laws that it lists, that a person needs to be generally careful about how he shows up in God’s house and what his appearance is like.